We were fortunate enough to win our SCTA section once again this year and gain a berth at the Combo-Sectionals at Indian Wells Garden. We won our section last year and went on the State Championship at Bakersfield. Unfortunately, this year we were a little short, and we didn't even make it to the Finals. We had a skeleton crew and didn't have our top players on the team competing. In fact, Friday night we only had 4 players, thus forfeiting the #3 doubles. We lost 2-1 and we were behind the whole way. We were fortunate enough to win 2-1 in our 2nd match on Saturday afternoon. 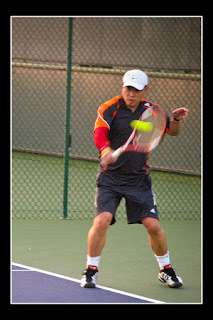 We needed to win all 3 matches but Donald tore his achilles tendon during this match. He was actually ahead in the match but couldn't run during the 2nd and the 3rd set tie-breaker. He tried his heart out. I really commend him for trying so hard. 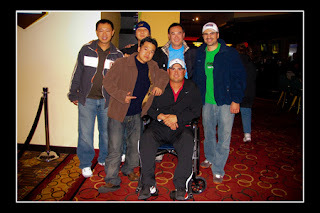 That night when the whole team went to dinner to celebrate our coming so far, we had to get him a wheelchair every where. That's why the picture above, he's in the wheelchair.